Photo above is from 1955. Pictured is Garriet Hartog on the left and Cornie Hartog on the right. In 1937, Hartog Elevator opened its doors at the former DeVries Elevator in Sanborn, IA. At that time, Cornie Hartog and his father Frank Hartog, went to work for Cornie's oldest brother, John Hartog. They received and unloaded corn from the corn shellers and trucked it out to feed mills. Prior to that, John had already established businesses in Seney and Granville, IA. He offered services such as coal, flour, tires, gas, oil, grain, twine, salt, feed, and seed. 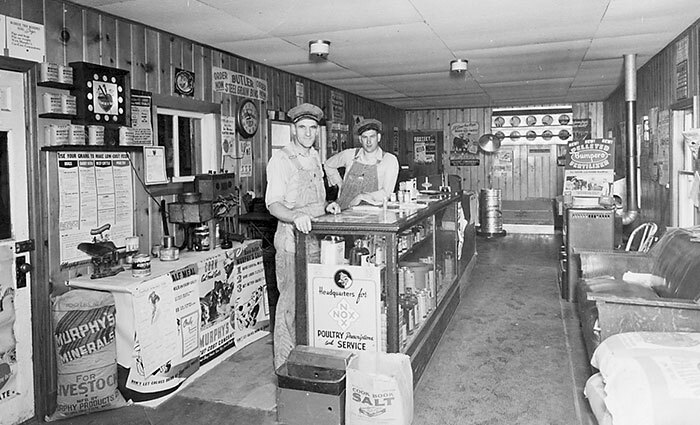 After World War II, Cornie and another brother Garriet bought the business from their brother John. They remained partners until 1962 when Garriet sold his interest in the business to Cornie and moved to California. Today, in addition to Sanborn, we also have locations in Plessis and Ritter, Iowa. In June of 2007, we celebrated 70 years of business in Sanborn. We provide for our customers by offering services to meet the needs of today's ever changing agriculture environment. Feed ingredients and grain are delivered throughout the Midwest with the tractors and hopper trailers that have become part of the grain-feed-trucking business. Complete feed and custom mix feeds are offered and delivered to swine, beef, and dairy operations. We at Hartog Elevator, Inc. are now in our fourth generation as a family owned and operated business.